This beautifully simple narrative celebrates the life of the great poet and author Andrew Barton Paterson. Tania McCartney and Christina Booth have cleverly combined forces to make this educational picture book engaging and relatable to a young audience. The text is nonfiction while the illustrations depict a parallel fictional story. The dreamy endpapers set the scene for this inspired outdoor adventure. 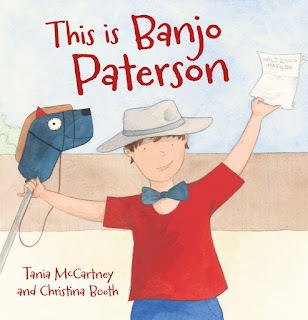 In a typical suburban backyard, a small group of resourceful young children recreate the events and experiences of Banjo’s life through their imaginative play. Throughout the journey we discover how this talented Australian got his nickname, his many boyhood interests, the people who influenced him and the many and varied jobs he undertook. The children’s re-enactment of Banjo’s life story is illustrated using a combination of single page images, double page spreads and vignettes. The playful illustrations provide entertaining rhyming dialogue, via speech and thought bubbles, as well as humour scattered throughout. This book is equally appealing as a bedtime story or read aloud in the early years’ classroom. It can be a great conversation starter about poetry and a natural introduction to Banjo’s work. A detailed biography, photos and some renowned verses can be found at the end of the book. If you like this book you may also like This is Captain Cook by McCartney and Booth.